If You Haven't Availed of the Steam Holiday Sale Yet, You're Crazy! The Testament of Sherlock Holmes, the latest instalment in the series of Detective mystery titles from Frogwares will be heading onto Xbox 360, PlayStation 3 and PC early next year. The official release date hasn’t been announced yet, but the team of developers have put together a second teaser trailer for those who are patiently anticipating the title. This second video shows a much darker side to our hero Holmes than we are used to, and we get to see how and why Doctor Watson begins to become concerned and to doubt the judgement of his partner. As Holmes commits acts Watson never thought him possible of in the past, his loyalty wavers. In the game, players will take on the mantle of both Holmes and Watson as they seek to find out more about the reasons behins the actions, uncovering the turth behind the unusual behaviour of our protagonist. Being the first Holmes game designed from the ground up for console based play, players will get to control the duo in third person, directly with a game pad, or with the traditional mouse control isf they choose the PC version. It will be interesting to see how well this control method works on console, as it has always been difficult to navigate a mouse cursor with a game pad – this could show other Adventure Games just how it should be done. We can only wait and see. 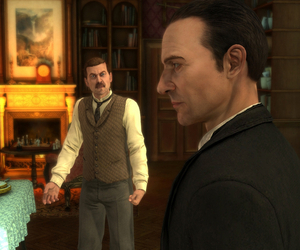 The Testament of Sherlock Holmes will release on PS3, Xbox 360 and PC early 2012.